His one-hour film interviews a wide variety of people working in forests: landowners, foresters, wildlife biologists, loggers, mill owners, cranberry farmers and Native American tribes, among others. In straightforward, unrehearsed language they explain their perspectives, which have a consistent theme: that cutting trees, when done right, is the essence of forest stewardship. The film’s host is Chuck Leavell, world-famous pianist and keyboardist for the Allman Brothers Band, Rolling Stones, and Eric Clapton as well solo artist in his own right. 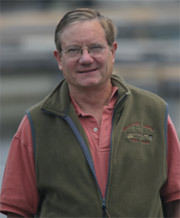 Chuck also happens to be one of the most well-spoken and committed conservationists in the country. Chuck, a certified tree farmer, conveys the film’s stewardship message by explaining that a lot of people think hands-off forest management is the best thing for trees and wildlife. However, what’s really needed is for people to “collaborate with nature in managing forests” - neither neglect them nor manage them too intensively. Many people don’t realize that what’s good for the forest is good, not only for wildlife, but for people too. As one national forest biologist explains, “Forests have evolved with fire, both man-caused and lightning-caused.” Therefore, after decades or even centuries of fire suppression, prescribed fire is needed for forest health. But this same biologist hastens to explain that “prescribed fire equals hazard reduction” for the people who live in or near forests. That’s because it eliminates “ladder fuels” that can lead to destructive, and expensive, crown fires. Tree harvest is discussed as an “art” that is the opposite of the land clearing that occurs when land is prepped for development. Thinning can mimic the role of fire and judicious use of “clear cuts” can open up a forest to allow regeneration of tree species that need sun - not to mention the grasses, wildflowers and shrubs that many species of forest wildlife require. Science backs this up. One example cited in the film is 9-acre cuts that were used in New Jersey to bring back Atlantic white cedar, a valuable tree both commercially and ecologically, which has declined precipitously since the late 1800s. The lack of response from the forestry community has disappointed and confounded Williams. Of the roughly 1500 copies he sent out, he got thank yous from about five percent. Foresters, like many other groups in society, are understandably more comfortable in their own echo chamber than engaging with people who may disagree with them. “But,” Williams argues, “that echo chamber is never going to make a difference. We can’t set things up as 'them versus us' because if we do, we’ll lose and we won’t succeed in changing the status quo." We Have the Better Story! The narrative of foresters and many of the people profiled in this blog is that conservation got taken over by hands-off “preservationists.” Let’s face it: at one point in time, they had the better story. Now, Williams and I and many others like us believe that we have the better story. It’s a story that puts mankind squarely back into the ecosystem. And who, given the choice, would choose to remain outside of nature rather than be a part of it? Is Land Stewardship Ready for its Own Prime Time Reality Show? Williams is an advocate for helping this message “percolate up” through nature and history channels, television specials and cultural events, and the use of stars like Chuck Leavell, as well as noted science experts. I would add: include the people, many of whom are featured in this blog, who still live on the land and work anonymously every day to enrich it. You may contact Bob Williams or order a copy of his film at Bob Williams or 609-221-0211.